We help as many families as we can each season. We work through partner social service agencies that help us match deserving client families to our trees. Unfortunately, we cannot meet individual requests for trees. 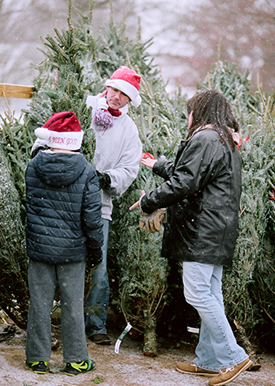 Trees are reserved weeks in advance and supplies are limited. During our giveaways, individuals must present a voucher from one of our partner agencies to receive a tree. Our long term goal is scalable growth to assist more families in more locations. Thanks for your understanding as we build our organization and learn from our early years and initial distributions. Click on a state to learn more about our locations, partner organizations and sponsors. "Thanks so much for making the holidays brighter for the children at CDA with your wonderful donation of Christmas trees for our families. Everything about the Christmas Tree Santas is remarkable."